This clinic is based on detection of early diabetic eye disease, Age Related Macular Degeneration, both wet and dry and other diseases that can affect the function of the visual tissues which is the retina. We often put drops to open the pupil for use to get a better view of the internal structures of the eye. It normally takes about 15minutes for the drops to work and approximately 2-4 hours to wear off. We advise all of our patients NOT to drive to the appointment as the drops will make driving vision very difficult. Edgbaston Eye Clinic is proud to offer such a high standard diagnostic test for its patients especially those with a family history of Age Related Macular Degeneration. 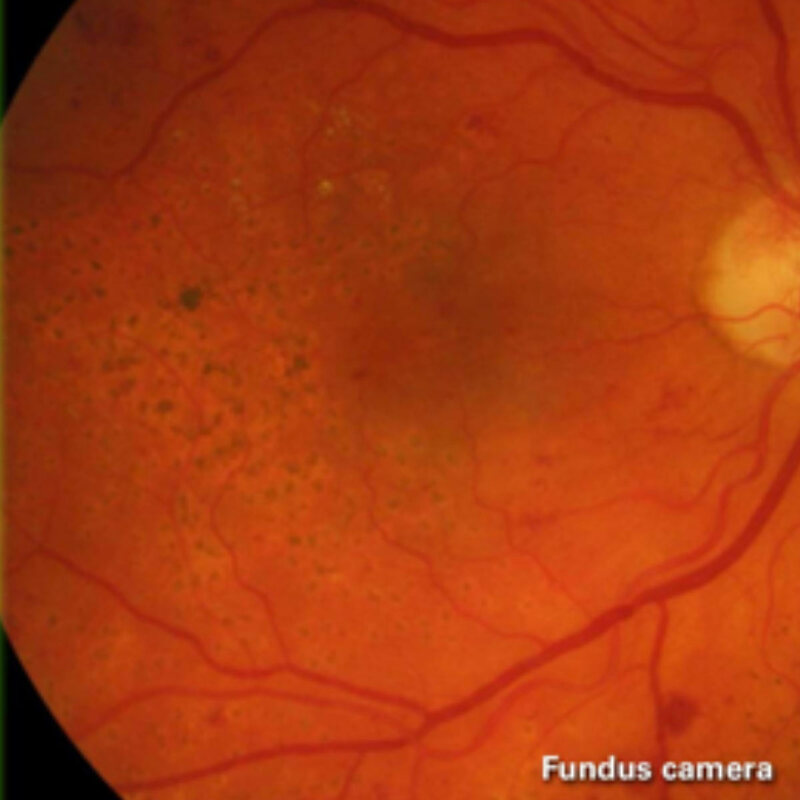 Video of progression of AMD using Blue Peak Autofluorescence – watch below for more information. MultiColor Scanning Laser Imaging uses three laser wavelengths simultaneously to provide diagnostic images that show distinct structures at different depths within the retina. The high-resolution, detailed MultiColour images can highlight structures and pathologies not visible and fundus photography. The combination of MultiColor with OCT brings a new dimension of detail and versatility to ophthalmic imaging. 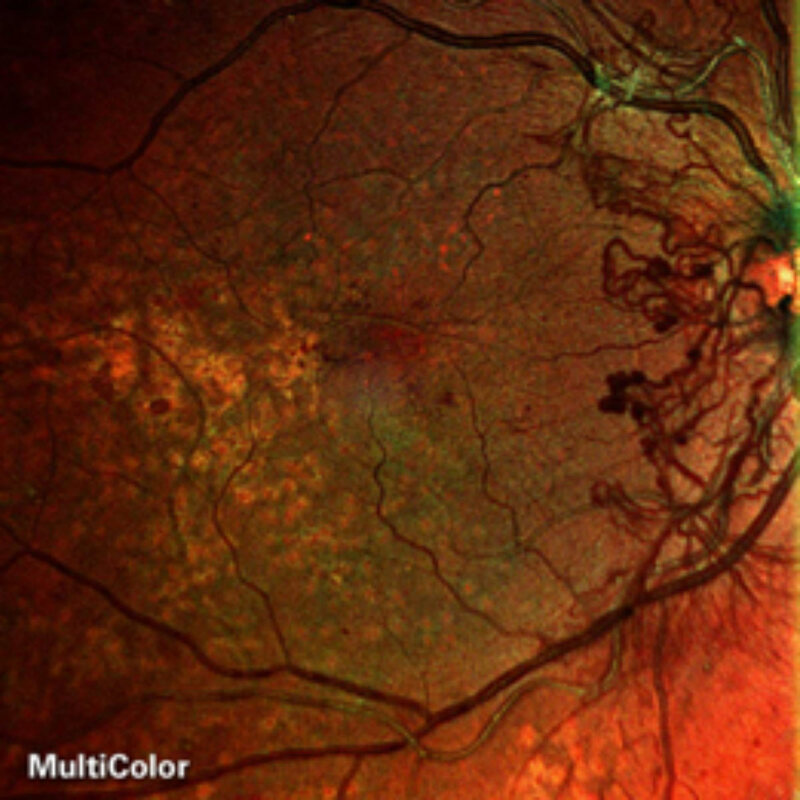 Multicolour imaging is very important in the diagnosis and monitoring of diabetic eye disease or diabetic retinopathy. The above two photos are for the same patient taken on the same day at the time of consultation. One with a camera and one with the Multicolour scan. I do not consider cameras/photographs good enough of a diagnostic tool for diabetic patients albeit a good tool to monitor damage already caused by this sight threatening eye disease.